Bitter~Sweet ™: Raising my Voice . . .
Raising my Voice . . .
Today is Type 1 Diabetes Awareness Day . . .
and my insulin pump has joined in the celebration! Hook up went really well, and so far everything is going fine. I decided to put the pictures from my appointment this morning in a Flickr set so you can click on over for the inside scoop! Now, lets get to the questions you guys left for me. I'm thrilled with how interested you are, and this will turn out to be a lengthy post. I do hope you will grab some coffee and take the time to read it over. The point of today is to spread the word about Type 1 Diabetes, and that's what this post is meant to do. I've tried to keep my answers somewhat entertaining, so you don't all feel like you're reading a medical text-book. I'm sure it's very clear that I'm not a medical professional, and I'm just sharing my personal experiences. From Bmom: "My (step) grandson, age 16, has diabetes and has had for years now. To be honest, I don't know the difference between type 1/2 (I believe his is 1). He's on insulin. We don't see him often -- but I don't know if there's anything we should/shouldn't be doing to help him." This is a great place to start off the discussion. The main difference between Type 1 and Type 2 is that in Type 1, the pancreas does not produce any insulin at all. Kaput, shut down for good, nothing going on in there. All Type 1 diabetics need to take insulin to stay alive. In Type 2, the pancreas is making insulin but the body isn't using it properly. Type 2 diabetes has more treatment options, like diet and exercise, pills, insulin, or a combination of these. What can you do to help him? Well, this may seem obvious, but remember him when planning a party or gathering (trust me, it doesn't always happen). Diet soda, lots of vegetables and maybe a low-sugar or sugar-free dessert option are always great to see. On the other hand, don't second guess him. Diabetics can learn to factor in occasional treats with a bit of "magic" involving our insulin, exercise and/or the food choices for the rest of our meal. Nothing sours a hard earned sweet treat than someone asking "should you really be eating that?". We know you care, but trust that we know what we're doing and please don't make us feel guilty. From jessica: "I guess I don't know much about type 1 because no one close to me has it... my grandma has type 2, and I know that was partly because of her lifestyle and eating habits of the past. So how early can you be diagnosed?" Type 1's causes are still a bit of a mystery, but for some reason the body's immune system gets confused and destroys the cells in the pancreas that make insulin, as if they were a virus. It most commonly happens in children and young adults (which is why Type 1 used to be referred to as Juvenile Diabetes and Type 2 was Adult Onset Diabetes). Once these cells are destroyed, symptoms crop up such as So Thirsty I Could Drink Lake Erie, Gotta Pee All The Time, Think I'm Gonna Hurl, I'm SO Tired and Wow, How'd I Get So Skinny (that last one sounds like a good thing, but isn't). All these icky aliments usually conclude with an ER trip, in which the diagnosis is made. 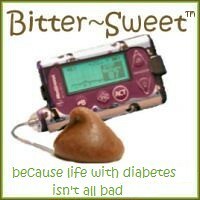 From Kristin: "I know a family and they have a child who has diabetes (type II, I think? but she might have a pump? so maybe type I?) and when her sugar is off she is constantly eating candy or drinking a soda. Makes me cringe every time! Shouldn't she eat healthier alternatives with natural sugar? Or is that ignorant on my part?" After reading my response to jessica above, I'm sure we all now suspect this girl is Type 1. (You guys are so smart!!) When you say her sugar is "off", it could be too high and it could be too low - but if she's downing sugar then it's low and needs to be brought back up before scary stuff like loss of consciousness and seizures happen. Now for people with diabetes, and for everyone, healthy alternatives are always best. Orange juice works great to raise blood sugar and is healthy, but hard to toss in your purse and carry around. Candy, such as Smarties and Sweet Tarts, are less healthy, but work great and travel well. Overall, it's most important to quickly get the blood sugar back where it needs to be, and worry about healthy eating when you're not in an emergency situation. From Kristie: "I am wondering if the pump size has changed since I saw one about 20 years ago. Maybe a photo of it with something (skein of yarn?) for scale would be helpful." I have a Minimed 722, which is 2 inches by 3.6 inches and 0.8 inches thick. For scale, here it is with a skein of Socks That Rock (for you knitters) and my iPod Nano (for the non-knitters), and also clipped at my hip. "Can you enjoy normal foods more with a pump?" You mean low-carb, low-fat, low sugar isn't normal?? Ha ha ha. But seriously, yes, I think so. With an insulin injection, the medicine all goes in at one time, regardless of how your body processes the foods you are eating. With the pump, you can use fancy settings to deliver insulin at a rate that better mirrors how your body will process the foods. "Will you have trouble sleeping wearing it?" I'll let you know tomorrow, but my guess is yes, for a long while. I'm a very light sleeper. Of course, I normally wake up numerous times during the night from Pea snoring (love you, honey), so I guess the pump won't change things much. "Does it go under your skin? Will it hurt for awhile?" The infusion has a tiny thin tube called a cannula (pronounced like "Can You La" and not how I said it "Can Ooooo La"). Anyway, that goes under the skin and stays there. Once it's in, it shouldn't hurt (I hope!!). "Will you preset it or something or do you have to keep loading it with insulin all day?" There is a reservoir on the pump where the medicine goes. I load it up and attach it to the insertion set. The pump has been pre-set with how much to pump into me throughout the day and night. And when I eat, I program the pump with my current blood sugar level and how many grams of carbs I'm eating, and it will give me the extra insulin I need. (Cool, huh?) The reservoir should hold enough insulin for three days. Then, I unhook everything, fill up a new reservoir, put on a new insertion set, and I'm set for another three days. 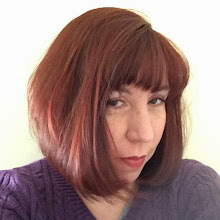 Heide asks: "Now that you'll be bionic will you knit even faster? ;)" I certainly hope so. A slow knitter like me needs all the help I can get!!! And from Jessica: "Did you knit it a cozy yet?" You bet I did - the day the pump got delivered. What's the best way to make an object that seemed foreign and scary more familiar? Knit a cozy for it!! And that's it! Thank you for all your questions, and I hope I did a good job answering them. For an idea of how it feels to live with diabetes day in and day out, I urge you to take a look at Kerri's post. She said everything I feel so much better than I ever could, and the realness of her words brought tears to my eyes.